MicroRNAs (miRNAs) are short (typically 21–22 nucleotide), single-stranded noncoding RNAs that regulate gene expression, mainly via posttranscriptional gene silencing. The miRNA biogenesis pathway is complex, involving numerous proteins, and is highly conserved in plants. If this pathway is hampered, miRNA accumulation is reduced or miRNA targets cannot be properly suppressed. Arabidopsis thaliana mutants in essential proteins such as DICER-LIKE1, HYPONASTIC LEAVES1 (HYL1), and HUA ENHANCER1 typically show pleiotropic defects due to the reduced suppression of numerous target genes facilitated by these miRNAs (Rogers and Chen, 2013). Protein phosphatase 4 (PP4) regulatory subunit 3 (PP4R3) promotes miRNA biogenesis by regulating the stability of HYL1 via dephosphorylation (Su et al., 2017). 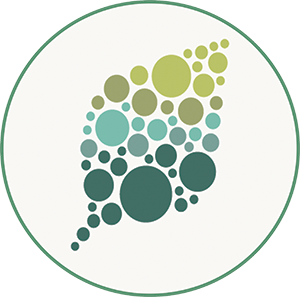 PP4 is a highly conserved serine/threonine protein phosphatase that plays roles in DNA damage repair and a variety of other processes in eukaryotes, although our knowledge of its composition and functions in Arabidopsis is limited. 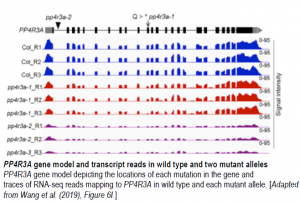 To determine where in the miRNA biogenesis pathway PP4R3A functions, the transcript levels of several pri-miRNAs were investigated and confirmed to be reduced in both alleles of pp4r3a, suggesting that PP4 promotes the transcription of miRNA genes (MIR). A chromatin immunoprecipitation (ChIP) assay revealed the enrichment of promoter regions of MIR genes, suggesting that PP4R3A associates with MIR promoters in chromatin. Since RNA polymerase II (Pol II) transcribes MIR genes, the authors conducted a ChIP assay and confirmed that PP4R3A promotes the transcription of MIR genes through the recruitment of Pol II. These researchers succeeded in uncovering several aspects of the complexities of PP4 function in Arabidopsis. In addition to the finding that the regulatory subunit PP4R3A promotes miRNA biogenesis with one of the two catalytic subunit genes, PPX1 and PPX2, PP4R3A was also shown to recruit Pol II to MIR genes. These findings increase our understanding of how complexes in the miRNA biogenesis pathways are recruited. Due to the conservation of these pathways, it will be interesting to see if these findings will be replicated in other organisms. Additionally, it would be intriguing to see how MIR gene promoters differ from those of other genes requiring Pol II transcription, as MIR genes require a separate transcriptional machinery. Rogers K and Chen X (2015). Biogenesis, Turnover, and Mode of Action of Plant MicroRNAs. Plant Cell 25: 2283-2399. Su C, Li Z, Cheng J, Li L, Zhong S, Liu L, Zheng Y, and Zheng B (2017). The protein phosphatase 4 and SMEK1 complex dephosphorylates HYL1 to promote miRNA biogenesis by antagonizing the MAPK cascade in Arabidopsis. Dev. Cell 41: 527–539.